Hidden Camera Detection – Are You Being Watched? How can you tell if you are being watched in your own home? While finding the cameras is the only definitive answer, there are tell tale signs that you should be aware of. If any of these sound familiar, it may be time to find an expert in hidden camera detection. Possibly the biggest sign that you are being watched is if pictures or video recordings of you turn up online. The other signs of hidden cameras may be subtler, but looking out for them will hopefully stop the problem from escalating to that stage. In the UK, it is the tenant and not the landlord who is responsible for changing the batteries in a smoke detector. So, if your landlord seems to be overly concerned with checking it personally, it might be worth you having a little spy inside. Another possible sign is if things have been moved in your home, these won’t be huge moves, but certain items may just seem slightly out of place, as if they have been moved and not quite been put back properly. It could be as small as a lampshade being not quite straight or a vase being off-centre. On their own, they don’t mean much, but a few of these things together could mean that you need to invest in someone to undertake bug detection. One final sign of surveillance cameras is if you believe you have been the victim of a robbery or house invasion, yet very little if anything has been taken. This, with items being out of place, are the most common reasons that individuals decide to take on the services of counter surveillance teams. If any of these signs sound familiar, don’t wait any longer, get in touch with Advanced Sweeping today by sending an email message to info@sweeping.co.uk and outline why you feel you need hidden camera detection. Our expert detector team will respond promptly and evaluate the situation without delay. 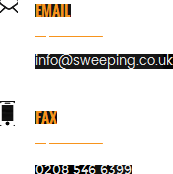 To see the full range of services we offer, visit http://sweeping.co.uk/.